with Glenn C. Smith, J.D. LL.M. Constitutional Context — Five-minute bites of background about the Court and Constitution — provides unbiased information and context for fully understanding the Supreme Court and ongoing disputes related to democracy and constitutional law. Learn to appreciate the complexity of constitutional questions, and make more informed decisions as voters and active citizens. 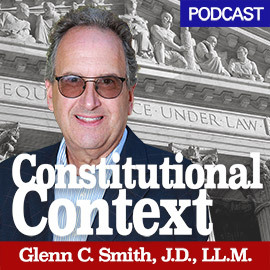 Constitutional Context is written and voiced by Professor Glenn C. Smith, a constitutional-law teacher and scholar at California Western School of Law, a visiting professor of political science at UCSD, the principal author of Constitutional Law for Dummies (Wiley 2012), and an instructor at the Osher Institute at SDSU. Do you have questions, feedback, or suggestions for future topics?